SP Authentic is one of hockey's most enduring brands. It ranks up there with the flagship Upper Deck set as one that draws in both a large number of set builders, rookie card collectors, and team and player collectors. It's typically not one of the rarest sets of the season, but secondary market prices are usually stronger than the print runs suggest. 2014-15 SP Authentic Hockey has some tweaks, but it's largely the same sort of formula that has made it popular for so long. Hobby boxes come with three autographs including one Future Watch autographed rookie card. The 2014-15 SP Authentic Hockey base set has 150 cards. Some Future Watch cards come autographed while others are not. No matter the case, they're numbered to 999. The signed portion of the set has 60 rookie cards including Johnny Gaudreah, Jonathan Drouin, Bo Horvat and Sam Reinhart. These have Patch parallels numbered to 100. Unsigned Future Watch players have Limited parallels numbered to 25. Select base cards have hit-based parallels as well in the form of Autograph (1:100) and Autograph Patch cards, which are available in three tiers. Autograph Patch cards are numbered to 100, 25 and 10. Authentic Moments highlight big moments from 2013-14 as well as throughout the history of hockey. Boxes have three total Authentic Moments cards with one player and at least one multi-player card. Autographed versions come with gold ink. No matter the type, these are extremely tough to pull. Sign of the Times, an SP Authentic staple, are back with anywhere from one to eight signatures. Other autographs include Premier Chirography (#/75), SP Chirography (#/35), Marks of Distinction (#/25) and Immortal Ink (#/10). 1994-95 SP Retro is inspired by one of the brand's earliest sets. Veterans are inserted 1:5 packs while Premier Prospects are 1:17 packs. Both have Gold Die-Cut parallels that are inserted 1:240 packs. 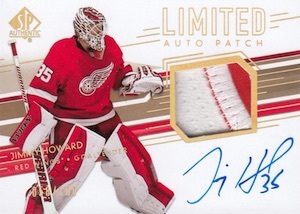 2014-15 SP Authentic Hockey also has Upper Deck Update cards featuring traded players and rookies who missed the cutoff for Upper Deck Series 2. Regular Update cards are inserted 1:7 packs while Young Guns Update cards are 1:25 packs. Like the main set, Exclusives are numbered to 100 while High Gloss parallels are numbered to 10. 2014-15 UD SP Authentic Future Watch Calle Jarnkrok 4 Color Rookie. #’d 68 100. 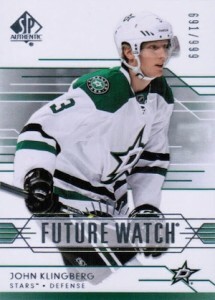 2014-15 UD SP Authentic Future Watch Calle Jarnkrok 3 Color Rookie. #’d 48 100. 2014-15 UD SP Authentic Future Watch Calle Jarnkrok 3 Color Rookie. #’d 7 100. 2014-15 UD SP Authentic Future Watch Calle Jarnkrok 2 Clr Patch Auto. #’d 100. 60 cards. Serial numbered #/999. 60 cards. Serial numbered #/999. Check out a detailed gallery. 5 cards. 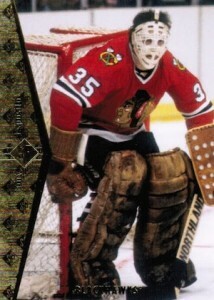 Serial numbered #/35. 11 cards. Serial numbered #/10. 5 cards. Serial numbered #/75. One of the best products each year! 5 stars! nice…..sarcasm. one sens future watch. curtis lazar. really??? how about hoffman? pageau? ceci? tired of upperdeck doing very few sens players. this is the reason i don’t by boxes anymore. SPA IS THE PRODUCT IM WAITING FOR..ALWAYS TOP NOTCH.BTW GARY PAGEAU AND CECI ROOKIES WERE IN 13-14 PRODUCT. sorry but im talking about auto patch cards. Hi Ryan. I was wondering to what degree the checklist is precise at this point? How does this work. Is it the actual checklist and it will not change anymore or at the release date we may have some surprises. I’m talking mainly about the base cards. Thanks. T.C.Boutique � This is the checklist from Upper Deck so I’m guessing it’s complete — at least as far as they’re going to confirm it. I wouldn’t be surprised if there is an additional surprise insert or two, like the Series 2 acetate Young Guns, as they have been doing this in most of their hockey sets this year. 1. Young Guns Update – Number 530 is Anthony Duclair, Arizona, not Troy Grosenick, Sharks. 2. Future Watch – Adam Clendening plays for Canucks, not for the Blackhawks. I would also like to thank you and your team for the tremendous work you do by listing all these checklists. It’s a lot of work and it’s extremely helpful, as well as the comments of the users are. I opened 2 cases and I give a 4 star for this product. The base checklist is ok, but it could have been better in my opinion. Some big names are missing, such as Eberle, Towes, Monahan, or Sedin (and perhaps others too). This is very subjective, of course, but I believe we should have seen at least Towes and Monahan, since Calgary has only one player in the checklist and even then, it’s a legend not an active player anymore (Fleury). Some other Teams are almost completely forgotten. Thus, Calgary, Buffalo, and Arizona have only one player in the entire base checklist. On the other hand, and this is my personal opinion, there are too many legends, which people don’t care about anymore. I’m talking here mainly from a seller point of view. Buyers don’t care anymore about players like Mike Liut or Darryl Sittler for example. Don’t get me wrong, I don’t mean by this that they don’t deserve the all due respect as former players who wrote history for their teams, but I found there are too many in the set, while younger players are forgotten. As for the design, I must admit I’m not a big fan of the Future Watch set. I like much better the one from the last season. I find that it had much more punch than this one. When I first saw the 2014/15 version I didn’t get any excitement at all. To much white, no distinctive signs. Another issue, and this is a problem in general, is the autos. Take a look at Gretzky’s autos. They are neat, beautiful, clear. 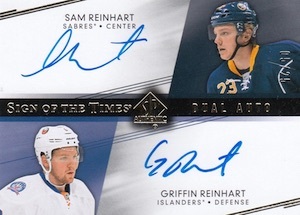 Take a look at Griffin Reinhart’s autos for example. 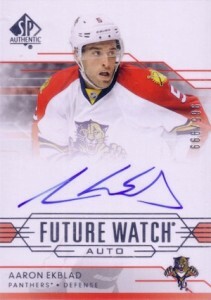 The guy simply put GRnt, in a hand writing that we barely understand (Future Watch Auto). I believe this is a bit disrespectful for the fans. It’s not a big deal, but still. Another point I would like to discuss concerns the updates. Nicely done, especially the Young Guns, but the buybacks are too many. I pulled a lot of doubles of almost unknown players. I like the idea of having buybacks in a set, but not too many, as it’s the case now. If I want cards from 2012/13 or 2013/14 I’ll buy them or buy that specific case. In the end, I’d like to mention that in the two cases I opened, there were very few damaged cards comparing with other collections. Very few notable rookies. Some good rookies in the Future Watch Autos, no big name in Future Watch Patch Autos. Great Cards! Love the updated upper deck basic cards. Jagr on Florida is an awesome card!!! 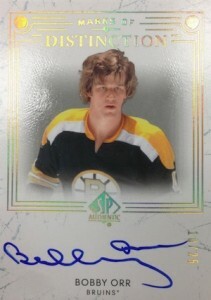 I really like the design this year, especially with the Authentic Moments and Immortal Inks gold autotographs. The base limited auto, SOTT and Marks of Distinction are also stunning design this year. I have already purchased many auto from these subsets and I’m planning on going for the full checklist. 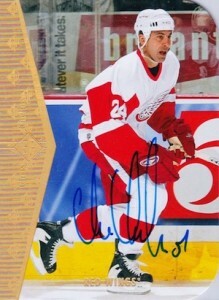 I also like that UD added some veterans players that didn’t have auto in previous UD products, such as Chis Chelios, Pierre Turgeon, Tom Barrasso, Mike Liut, Rob Brown, etc. My favorite product this year so far! 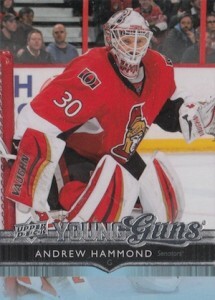 How hard are the Young Guns Acetate to get? Cant find any info on them after i pulled one. Year after year SP product doesn’t change, the base set is so easy to make you have to give it away. On the other hand I wonder how many cases are needed to complete a master set? Besides that I find there are way too many different parallel sets and not enough big hits for your money. us. All that to say I wish there were only Upper Deck one and two plus O-Pee-Chee. The only thing I have to criticize about this product is the upper deck update cards for series 1 and 2. Not a fan of it and should have not been put in. As for the rest of I love the autos future watch, non auto future watch and sign of the times. I am a longtime collector of SP Authentic Hockey. Love the autos and the occasional patch when I get one. The retro theme this year was interesting. On the positive side I got 7 autos (4 Future Watch and 3 SOTT’s) in the two boxes I opened. The collation was very disappointing. In the two boxes I got 85 of the 150 base cards (57% completion) with a whopping 70 redundant cards. The base cards in each box were almost identical. While the fun of SPA is the autos and patches only getting 57% of the way to completion of the base set after opening two boxes is discouraging. Has anyone pulled an acetate Series 2 YG? I pulled one out of a box today, Tobias Reider, and I am wondering how rare this is, i didn’t see anything about it on the checklist. Great product, last 6 pack i open i got Ekblad fwa, Gostibehere fwa and Malkin chirography! Highly recommend!! 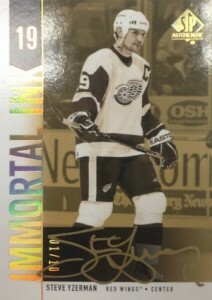 I bought 7 packs and pulled a modern moments Rob Blake Mike Modano dual auto! Good product. 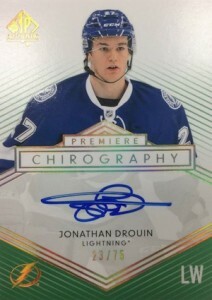 Pulled a Drouin future watch auto and a UD High gloss card. I like the design and layout. It’s one of the few products UD gets right.